Occupation: Defense Attorney at Gavin Law Offices. Brief Physical Description: Katalina is an average height woman, with honey ginger hair stylized in twin braids hanging over her shoulders. She has gray blue eyes and tan skin. She has a round face with petite features, and she’s often mistaken as being younger than she really is. Brief Personality Description: Katalina shows a very calm demeanor and refined tastes, and she makes use of this in the courtroom as well as within her family. Although she can be perceived as someone indifferent, she takes advantages of her looks by making people trust her more than they should. Connection to canon characters (if applicable): Klavier and Kristoph’s mother. Brief Background: Katalina’s origins come from a very humble family, to which she left immediately after starting law school. Since then, she denies any connection to them, going so far as to never mention her last name until changing it once she got married. While her manners are taken as cold and dismissive, she’s actually very dedicated and wholehearted to her family, especially to her children. Along with her husband, she ran the Gavin Law Offices until the day he disappeared, leaving all the duties to her along with Kristoph, who was doing his internship there. One of her biggest flaws is that she’s greedy, and since her origins, she’s developed a need to raise and keep money at all costs, not caring about the consequences. It was especially denoted once she saw herself alone and struggling with her young children. To satisfy all of their necessities, and so she wouldn’t go back to the life she had before, she goes as far as to work for a mafia family, becoming the fundamental pillar of the culprits when in need of legal help. Feeling as if her family needed even more support, she would forge evidence in order to free them of a guilty verdict. She’d feel no remorse when doing this. Until one day, it paid with her life. Katalina was murdered by the enemies of her clients. A local mafia boss demanded her dead when a client of hers killed his son and walked free from charges. Though, seeing as how risky her job was, she had foreseen her death since she started working with them, and so she had Kristoph prepared for her destiny. She entrusted him with Klavier, who was 9 years old at the time, the law firm, and left. The next day, she was found dead, a bullet ripping straight through her heart. - Katalina comes from the name “Catalina”, which means immaculate and pure, something that greatly contrasts with the character’s background. - The “G” emblem is actually part of the family’s heirloom. - Klavier is supposed to take more after her mother, hence the braids, skin color and young appearance. - As a result of Katalina’s death, young Klavier develops a sense of justice, along with the need to always find the truth no matter the situation. 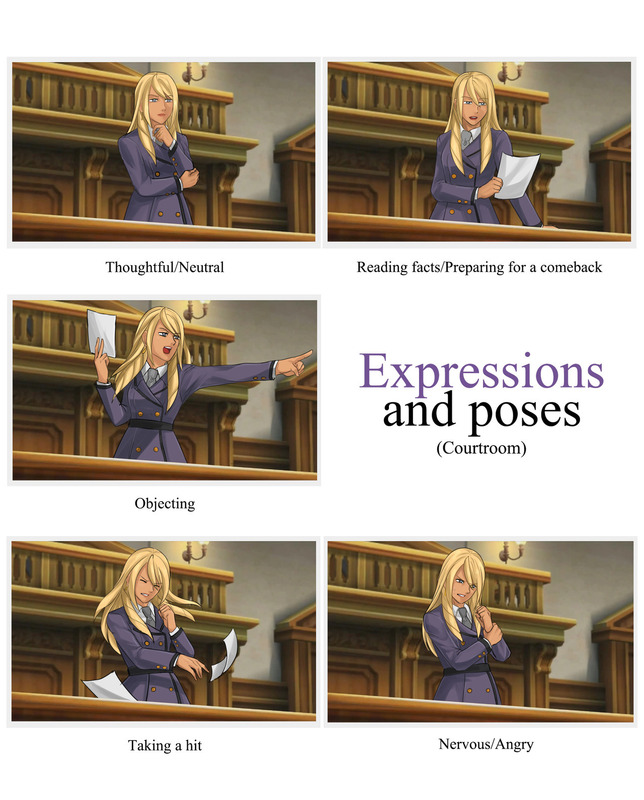 - Katalina was planned as a main trigger for Klavier’s development. 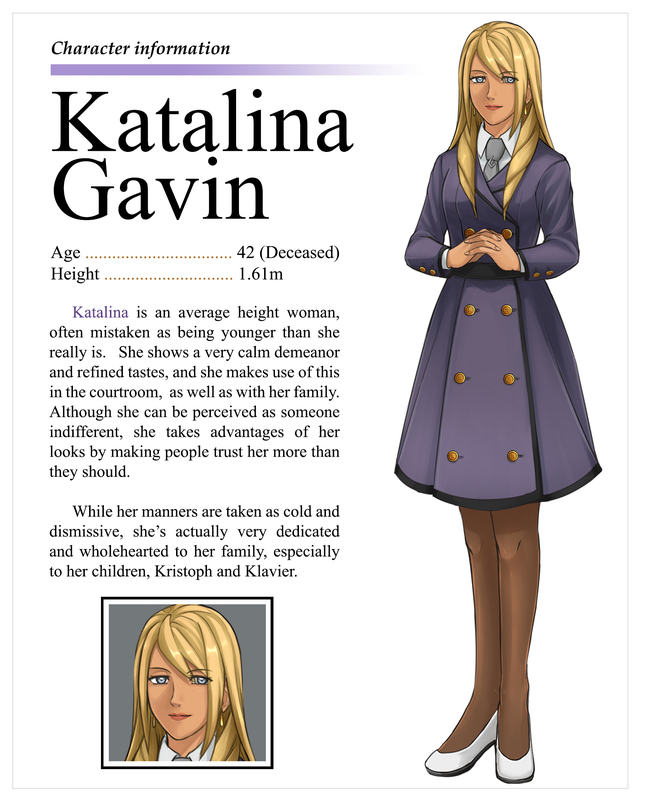 She’s been thought as a way to include Klavier as a suspect in a case, where Katalina’s past (the mafia family) comes to haunt the brothers in the future. Since Kristoph is already in jail, Klavier becomes the subject of their revenge.